I've received a few inquiries regarding the book I've been using to learn the stitches for the bead pieces I've been making. Here's the only bead stitch book in my craft library thus far. 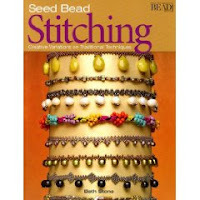 If anyone has recommendations on other books with advanced (or different) bead stitches, please post them in a comment! Thanks.